“Fantasy and Farewell.” Michael McLEAN: Suite for Viola and Orchestra (2008). Robert SCHUMANN: Märchenbilder, Op. 113 (1851; arr. Michael McLEAN, 2011). Dmitri SHOSTAKOVICH: Viola Sonata, Op. 147 (1975; arr. Vladimir MENDELSSOHN, 1991-92). 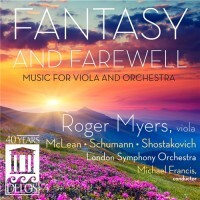 Roger Myers (vla), London Symphony Orchestra, Michael Francis (cond.). Delos DE 3441 (1 CD) (http://www.delosmusic.com/). Commissioned by Myers to commemorate his mother’s passing, McLean provides a particularly expressive tonal work, a welcome cross between Barber and John Adams. Three movements seem short for a suite; however the forms, Prelude, Passacaglia and Chorale warrant the designation. The last movement elegantly integrates Bach’s Befiehl du deine Wege, from the St. Matthew Passion. McLean’s warm orchestration extends to Schumann’s four pieces. He takes appropriate liberties, permitting themes to pass flexibly, more so than Schumann might have done. Myers rides the Lebhaft as if a wild horse. The Shostakovich arrangement is the biggest effort, difficult all around. Its composer’s last completed work, the severe and restless Sonata asks the viola to labor as an indifferent piano figures along. I’m not entirely convinced that Rumanian violist/composer Mendelssohn’s viola with string orchestra and celesta arrangement makes sense. The slight glimmer of Beethoven’s “Moonlight” sonata is more evident with a piano. Maybe the piano and viola were equals, but now effort is required to keep the orchestra from becoming merely an accompaniment. Icy gestures well suited to the piano are less effective, and generally, the orchestra mass must tread lighter if not to overwhelm. Violists are forever craving repertoire, and so it’s understandable this transcription finds a fresh recording. Yuri Bashmet (DG B0007622-02) may take the arrangement slower in places: His is definitely more forlorn, maybe tending to fall apart which fits the Sonata’s spirit. However, Delos comes through with more details at the brisker pace. The Londoners are lush in the McLean, light footed in the Schumann, and appropriately terrifying in the Shostakovich. Myers is a bold player, comfortable and deft across these varied concertos. He employs a gorgeous 1763 Guadagnini. 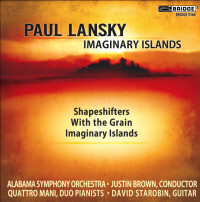 Paul LANSKY: Shapeshifters (2007-08)1; With the Grain (2009)2; Imaginary Islands (2010). Quattro Mani1: Susan Grace, Alice Rybak (pnos), David Starobin2 (guit), Alabama Symphony Orchestra, Justin Brown (cond.). Bridge 9366 (1 CD) (http://www.bridgerecords.com/). Until recently, Lansky’s appearance in history books would have emphasized his computer and electroacoustic work. To paraphrase Lansky’s explanation for such a visible and recent exploration of instrumental and orchestral music: “Life is short.” Is it a surprise, then, that an ea master’s concertos reveal a softer side? These works slide comfortably into post-Romantic, often minimal flavors. Lansky considers anything (a Cuban dance, a Rachmaninoff cascade, Milhaud’s polytonality, etc.) that might spark an idea. Shapeshifters’ two pianos are constantly twinkling, a kaleidoscope’s internals set upon lively seas. The guitar concerto’s four movements describe different textures: Redwood Burl, Karelian Birch, Quilted Beech and Walnut Burl. All of Starobin’s notes and gestures are perfect. With its energetic bubbling and picture-perfect scoring, the inventive Imaginary Islands would work nicely in an IMAX movie. 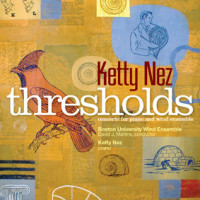 Ketty NEZ: thresholds (2012). Ketty Nez (pno), Boston University Wind Ensemble, David J. Martins (cond.). Ravello RR7876 (1 CD) (http://www.ravellorecords.com/). Inspired by the fluid motions of Renaissance lines, the consistent modality and instrumentation of Nez’s piano concerto reference Bartók and Stravinsky’s Neoclassical idiom. Throughout the large 26:33 single movement, impeccable winds keep the detouring piano in constant check as she creates something distinctive and continually evolving. Spectral explorations appear towards the end as the soloist’s harmonies ascend the keyboard. 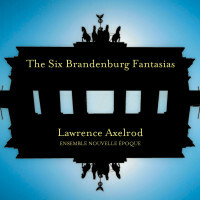 Lawrence AXELROD: Six Brandenburg Fantasias (2002-06). Ensemble Nouvelle Époque, Lawrence Axelrod (cond.). Innova 876 (1 CD) (http://www.innova.mu/). Meant to accompany their famous predecessors, there’s little in these variably scored fantasia / concertos other than their instrumentation which specifically recalls Bach. They are forthrightly modern and decisive, their prevalent massed chords and few tunes providing wide contrasts with their inspiration. Aleatoric moments contribute flexible textures that hide some repetition. Perhaps the cellular handling of notes and gestures suggests Martinů. Indeed, the dynamism and the textural interplay suggest that the Czech master might be more influential than the Cantor of St. Thomas. These fantasias are short and tantalizing. The detailed notes indicate more happening than initially meets the ear. 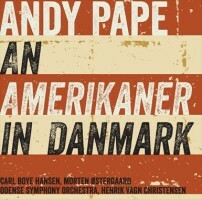 Andy PAPE: An Amerikaner in Danmark (2003); Suburban Nightmares (2006)a; Traces of Time Lost (1998/2011)b. Carl Boye Hansena (tuba), Morten Østergaardb (bsn), Odense Symphony Orchestra, Henrik Vagn Christensen (cond.). Dacapo 6.220567 (1 SACD) (http://www.dacapo-records.dk/). The abundant Gershwin bits are easy to spot in Pape’s titillating An Amerikaner in Danmark, with Danish tunes and quoted material by the composer and his colleagues harder to spot. All-told, the breezy familiarity returns often enough to Gershwin, so that it’s possible to appreciate this solely as an Amerikaner. Conversely, I’m sure any Danes oblivious to Gershwin will find plenty to enjoy in this superlative piece for large wind ensemble and percussion. The tuba and bassoon concertos require full orchestra. A Preludium and Postludium wrap The Suburbs and The Nightmare. The agile tuba expresses both calm and conflict as it illustrates Pape’s idea that suburban life creates an illusion of security easily shattered. The smart bassoon concerto builds powerful movements from simple conceits. For example, in the first movement, everything the bassoon does is echoed by the orchestra in different ranges and tempos. Other than canonic, the result consists of shifting and peeling layers. “Resolve.” Paul HINDEMITH: Concerto for Clarinet and Orchestra (1947)1; Quintet for Clarinet and String Quartet, Op. 30 (1923, rev. 1954)2; Sonata for Clarinet and Piano (1939)3. Richard Stolzman1,2,3 (clar), Slovak Radio Symphony Orchestra1, Kirk Trevor1 (cond. ), TASHI2: Ida Kavafian, Theodore Arm (vln), Steven Tenenbom (vla), Fred Sherry (vlc), Yehudi Wyner3 (pno). Navona Records 5934 (1 enhanced CD) (http://www.navonarecords.com/). If we agree that composed music reflects a sequence of choices made by a composer to be enacted in time (whether explicitly notated or open to chance), then to appreciate a composer’s music is to find his or her choices appealing. I have never understood Hindemith, even though my scholastic bent should so incline me. Hindemith’s tunes don’t stick. I don’t understand how he transforms his material. If I catch Mathis der Maler or the Weber metamorphoses on the radio, I never recognize them. I must be blind to Hindemith’s intervals and harmonies. 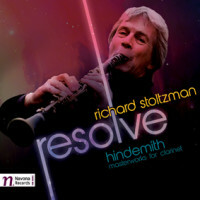 That said, I appreciate a good tour, which is what Stoltzman provides for this collection of clarinet-featured pieces. There are great players here: Tashi recorded the Quintet in 1988, which makes this historic and collectible. The Concerto was recorded in 2003, and the Sonata just last year, when former Hindemith student and colleague Wyner was 83! Premiered by Benny Goodman with the Philadelphians under Ormandy, the Concerto permits the soloist to flow across a busy orchestra. If I squint, I can imagine that the five-movement Quintet is by Martinů, perhaps because it dates from the early 1920s. The central scherzo asks for a strident E-flat instrument to pierce through confused folk tunes. I am embarrassed to admit that I hadn’t noticed that the final movement is the same as the first, but played in retrograde. The Sonata is cut into four portions, alternately sweet and capricious. Stolzman and Wyner’s collaboration makes the labyrinth sound easy. The enhanced CD offers booklet notes and videos. Johannes SCHÖLLHORN: clouds and sky (2010)1; rota (2008)2; red and blue (1999)3; a self-same song (2010)4. Jan-Philip Schulze1 (pno), WDR Sinfonieorchester Köln1, Peter Rundel1 (cond. ), Gareth Davis2,4 (cb-clar), JACK Quartet2, Ensemble S3. mode records mode 255 (1 CD) (http://www.moderecords.com/). 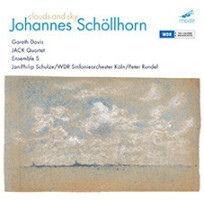 Schöllhorn’s clouds and sky may be as close to an anti-concerto as one can get. Accustomed to working with found materials, Schöllhorn elongates Fauré’s Nocturne No. 12 (1915). As the original expands, sometimes the gaps persist; otherwise Schöllhorn adapts nearby material to fit the newly created fissures. If the nocturne was familiar, it no longer is. The piano elucidates while the orchestra plies slow runs. As a concerto it’s disarming – Fauré in a fog. The remainder of the release proceeds with more convention, easily taken for studies in homogeneity or Procrustean approaches to existing material. Rota forces a contrabass-clarinet and string quartet to dance, much the way desperados fire bullets near their victims’ feet. Red and blue for six percussionists collapses and unfolds purely metallic sounds. For a self-same song, a solo contrabass-clarinet wriggles through the essence of a Gershwin tune, A Foggy Day, which never properly presents itself.